Grab Guard : Tired of being vulnerable to thieves anywhere you go with a purse, briefcase, laptop case or anything else Grab Guard® is THE anti-theft solution. So easy to use-one snap & your belongings stay where they belong- with YOU. This innovative device fits in the palm of your hand. With one quick pull of the unique "Lock Line" and the simple setting of your 2 digit personal lock code, Grab Guard® securely attaches anything with a handle or strap to any safe location. Grab Guard® has been created in colors to fashionably fit women's handbags and men's briefcases, as well as in bright, fun colors for kid's backpacks, Grab Guard® works for everyone's personal security needs in every situation. Grab one today, feel safe tomorrow! I was lucky enough to do a review for the Grab Guard. When I was younger I actually had my purse stollen at the store. I lost everything. 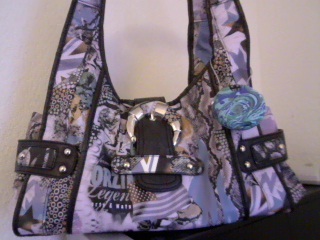 My favorite purse, wallet, keys, ID, money, everything. I felt like my world was turned upside down. I don't ever want anything like that happen to my readers, or ever happen again. I love my Grab Guard! I have used it at the grocery store since day one when I received it. I am always panicky when I go to the store I do not leave the cart with my purse in it out of my sight for even a second. 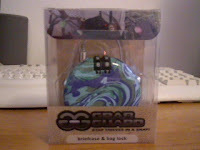 But since I have my Grab Guard in Blue Marble $19.99! ..$19.99 is nothing compaired to the loss of your personal belongings, and the frustration it involves getting your life back on track. I have played around with my Grab Guard and realized all it's uses. 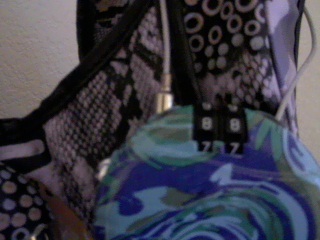 You can ribbon the end of your purse zipper handle and grab guard it to your purse handle so if you have nosey family as I do..You can grab guard your purse and keep sticky fingers out of your belongings. There are tons more uses, but I don't have enough room for them all. Here is my Grab Guard with my favorite purse my Husband bought me. Grab Guard goes great with any purse of any shape, color, size, or design. With the large Variety that Grab Guard has you are sure to find one that you, your family, or friends can't live without. Grab Guard would make a great gift for anyone. Not only would they love grab guard for the cute colors and designs, but they would be greatful for the thoughtfulness you put into the gift of their purse protection. It's a win win!. With one pull of the unique "Lock Line" the Grab Guard securely attatches to anything with a handle, strap, or any other safe location. I know the Grab Guard would be and third hand at any Mall. I don't trust anyone at my local mall, I hold my purse so tight that sometimes I want to hide it under my shirt for protection. The simple 2 digit personal lock would be the most easiest code to remember, and the easiest to unlock. I have the hardest time trying to unlock locks if they are not key locks. So this would be great for anyone at any age or disability. Grab Guard would be great for your younger children for their backpacks at school. And they would love the bright assorted colors. ♥ I received no monetary compensation for this review. I was provided a Grab Guard to try and give my honest opinion(s).